Kazimierz Dąbrowski’s five-level theory of personality development, the Theory of Positive Disintegration, is one in which the experience of all emotions is essential for the process of individual growth toward the personality ideal. 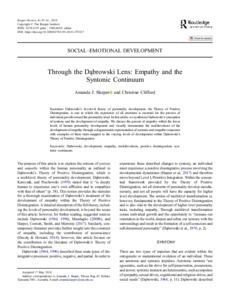 In this article, we synthesize Dąbrowski’s conception of syntony and the development of empathy. We discuss the genesis of empathy within the lower levels of human personality development and visually demonstrate the multilevelness of the development of empathy through a diagrammatic representation of syntonic and empathic responses with examples of these traits mapped to the varying levels of development within Dąbrowski’s Theory of Positive Disintegration.